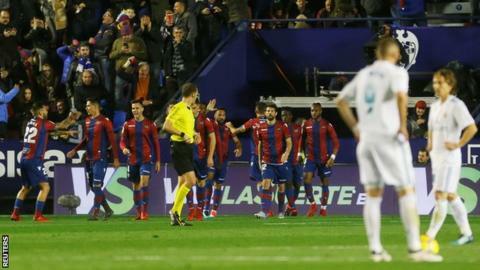 Real Madrid boss Zinedine Zidane said he was "disgusted" with his side after they conceded an 89th-minute equaliser against Levante. Isco slotted home after 81 minutes, but Giampaolo Pazzini earned Levante a point after he was played in behind the Real defence. Emmanuel Boateng earlier cancelled out Sergio Ramos' opener for Real. The defending champions are fourth in La Liga, 18 points behind leaders Barcelona, who play Espanyol on Sunday. It was Real's sixth draw of the season - combined with four defeats - and they are only two points clear of fifth-placed Villarreal to increase the pressure on Zidane. Real are without a clean sheet in six La Liga matches and their defence was arguably at fault for both goals with Pazzini unmarked for the equaliser and Jose Luis Morales left one-on-one for Boateng's first-half equaliser. Keylor Navas saved Morales' shot but the ball fell to Boateng, who calmly swept home. Real missed several second-half chances, with Cristiano Ronaldo, who was later replaced, having a shot from close range blocked by Cheick Doukoure. Karim Benzema scuffed wide from the edge of the box after dribbling past four defenders, while Ramos forced Levante goalkeeper Oier into a smart save from the resulting corner. "This year for us is a complicated year because we haven't put six good results together in a row," Zidane said. "We are disgusted with the result and the performance of the team. "The game was controlled, doing the most difficult things, but we didn't know how to score. Then there are two errors we make in the two goals." Match ends, Levante 2, Real Madrid 2. Second Half ends, Levante 2, Real Madrid 2. Attempt missed. Luka Modric (Real Madrid) header from the centre of the box is close, but misses the top right corner. Assisted by Lucas Vázquez with a cross. Raphael Varane (Real Madrid) is shown the yellow card for a bad foul. Foul by Raphael Varane (Real Madrid). Giampaolo Pazzini (Levante) wins a free kick on the left wing. Attempt saved. Luka Modric (Real Madrid) right footed shot from outside the box is saved in the bottom left corner. Assisted by Lucas Vázquez. Substitution, Real Madrid. Lucas Vázquez replaces Toni Kroos. Goal! Levante 2, Real Madrid 2. Giampaolo Pazzini (Levante) right footed shot from the centre of the box to the top right corner. Assisted by Jason with a through ball. Coke (Levante) is shown the yellow card for a bad foul. Attempt missed. Roger Martí (Levante) header from very close range is close, but misses to the right. Assisted by José Luis Morales with a cross following a corner. Attempt blocked. Giampaolo Pazzini (Levante) left footed shot from the centre of the box is blocked. Attempt blocked. Jason (Levante) left footed shot from outside the box is blocked. Corner, Levante. Conceded by Casemiro. Offside, Levante. Coke tries a through ball, but Giampaolo Pazzini is caught offside. Marco Asensio (Real Madrid) is shown the yellow card for a bad foul. Jason (Levante) wins a free kick in the defensive half. Corner, Real Madrid. Conceded by Antonio Luna. Foul by Giampaolo Pazzini (Levante). Substitution, Real Madrid. Marco Asensio replaces Cristiano Ronaldo. Goal! Levante 1, Real Madrid 2. Isco (Real Madrid) right footed shot from the centre of the box to the bottom left corner. Assisted by Karim Benzema. Cristiano Ronaldo (Real Madrid) wins a free kick in the attacking half. Foul by Cheick Doukouré (Levante). Substitution, Levante. Giampaolo Pazzini replaces Ivi. Attempt saved. Daniel Carvajal (Real Madrid) right footed shot from the right side of the box is saved in the bottom right corner. Assisted by Luka Modric. Attempt saved. Sergio Ramos (Real Madrid) header from the centre of the box is saved in the bottom right corner. Assisted by Toni Kroos with a cross. Corner, Real Madrid. Conceded by Sergio Postigo. Attempt blocked. Karim Benzema (Real Madrid) right footed shot from the centre of the box is blocked. Assisted by Marcelo. Attempt saved. Isco (Real Madrid) right footed shot from the right side of the box is saved in the centre of the goal. Assisted by Luka Modric. Attempt blocked. Isco (Real Madrid) left footed shot from the centre of the box is blocked. Foul by Roger Martí (Levante). Attempt blocked. Isco (Real Madrid) header from the centre of the box is blocked. Assisted by Daniel Carvajal with a cross. Substitution, Levante. Roger Martí replaces Jefferson Lerma because of an injury.